Chateau / Country House592 sq. ft. The "Finca El Moral" was a family home that has been recently remodeled with quality materials and finishes for an unforgettable stay where our dedication is evident in every detail. On the farm there are three houses one, two and three bedrooms, respectively. They are independent houses that share common parking areas, gardens and a large terrace with heated pool and fenced to protect young children. Fully equipped with kitchenware, microwave, toaster, coffeemaker, linens, towels, blankets, hairdryer, TV and free wifi. Lovely villa in a beautiful finca, close enough to Puerto Mogan for the beach but nice to escape the crowds and enjoy the pool in the afternoon. Fresh papaya and avacodo's from the gardener were very welcome! Perfect Setting for a wonderful holiday. Thank you so much for your comment. We are happy to know that our property met your expectations and that you had a lovely time with us and pretend to come back. We certainly hope to see you in the future and appreciate your kind words. Parctical and well equipped appartment for a family. Convenient location in a valley, a few minutes drive from the village, beach and port (a car is recommended). Very friendly and helpful owner and staff. We had a relaxing and enjoyable holiday and would consider coming back. A fantastic place. Good space in the departement. Wonderfull surroundings, heated pool, good service. 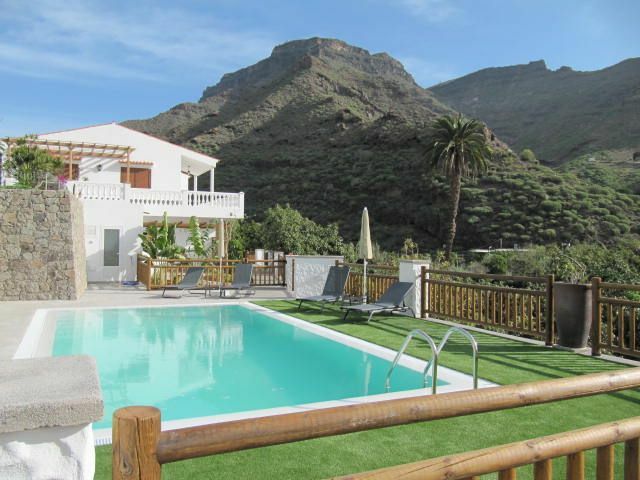 La Finca El Moral is located in the valley of Mogan famous for its climate and 3 kilometers from Puerto de Mogan, known as the Venice of the Canaries. El Puerto de Mogan, with golden sandy beach, is a seaside neighborhood for its unique setting and natural beauty, has given rise to one of the prettiest areas of the Canary Islands. Its marina, meeting point for numerous international nautical enthusiasts with its optimal marine atmosphere, making the Puerto de Mogan, an unforgettable place. The natural environment of Mogan well worth a visit. It is an area of ​​great geomorphological and botanical interest, as well as unique landscape and archaeological values. In this area it is possible to appreciate large extensions of tabaibals, endemic plants of the Island. Anfi Tauro Golf - 15 minutes by car. A wonderful 18 hole course with spectacular sea & mountain views designed by Von Hagge, Smelek & Baril - and also a pitch & putt. El Salobre Golf - 20 mins from Mogan by car towards Maspalomas. Two courses, North & South, with wonderful mountain views. Meloneras Golf - 25 minutes from Mogan. A spectacular Ron Kirby designed course with sea & mountain views, a wonderful test. Maspalomas Golf - 30 minutes from Mogan. Oasis Golf and also El Cortijo Country Club - approximately 45 minutes from Mogan at Telde. Las tarifas son para la vivienda de 1 habitación 70 euros por día, para la de 2 habitaciones 90 euros y para la vivienda grande con 3 habitaciones , 2 baños y gran terraza 150 euros por día.